Employees complain when you don’t have a handbook, but, when you have one, they don’t want it! An employee handbook is very easy to create, but probably the most overlooked aspect of employment documentation. 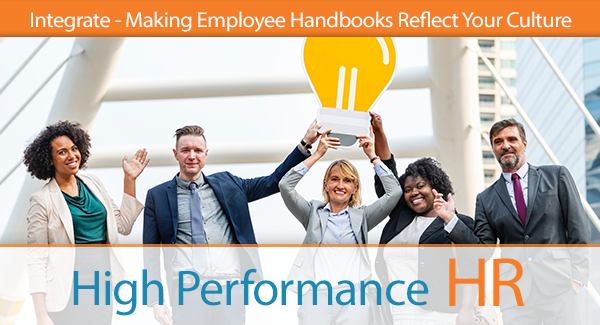 One thing is for sure: if a company has multiple shifts or multiple locations or just multiple employees, an employee handbook can certainly help keep all employees on the same page. Handbooks are always a delicate subject. But when done right, and with employee input, this tool can make a difference. Reflect your MVV. Your handbook should be an absolute reflection of your MVV, which essentially amplifies your culture. Someone who is unfamiliar with your organization should be able to pick up your handbook and see your heart within its reflection simply by the tone and the guiding principles you lay out for your employees. The front of the handbook should contain your MVV, followed by the President’s message as to why the MVV is important to the company and how it was created. Make it relevant. Having reviewed hundreds of handbooks over the years, one thing is certain and that is that most are horrible. They are irrelevant, often don’t convey the culture of the organization and are more about preaching or dictating than guiding. Keep it simple. A handbook should not contain every scrap of information about the company. Worse yet, it should not contain every possible scenario in which an employee violation could occur. Keep it simple and you will have a greater impact than if you over-complicate or over-stimulate the reader. Many employees I’ve spoken with over the years tell me that, if a handbook is interesting, they will read it to learn more about the company, but, if it just rambles on over policy and procedures, most will put it down after two pages. The ideal handbook will inspire the reader to learn — learn more about the company. Keep it legal and legit. Always ensure you include the appropriate legal clauses. There are far too many to list here but a few that come to mind speak toADA, FMLA, Employment at Will, EEOC etc. You want to make sure you cover your bases. In closing it is important to note that having a handbook is oftentimes the only opportunity for employers to memorialize what is expected of employees. But always include what employees can expect of you! A handbook should never be a one way street of core policies of the organization; if it is, you will chill the warmth right out of the organization, a chill you will live to regret. We Value Your Comments. Thank you for taking the time to read our post in this series on how to build “Kingdom Minded” Companies. Please share your thoughts and experiences on employee handbooks. How did the ones that you have used fit your organization? Did they match your culture? Did they drive the behaviors the company and employees desire? Thank you for contributing to our community, and thank you for sharing your thoughts.